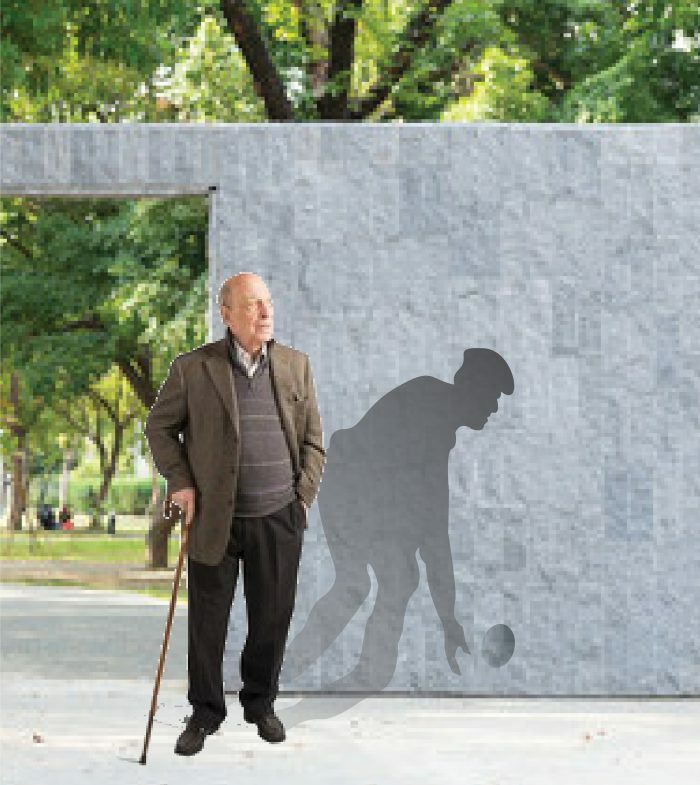 Frailty is a common syndrome that occurs from a combination of de-conditioning and acute illness on a background of existing functional decline that is often under recognised. Frailty can affect up to 25% people aged 70 and over this equated to approximately 26,000 people residing in Northern Sydney. People with frailty have 2 to 3 times the health care utilisation of their non-frail counterparts and experience higher morbidity, mortality as well as lower quality of life. Frailty can increase functional decline, increase the risk of falls, contribute to longer length of hospital stay and increased chance of institutionalisation. Many of the causes of frailty can be managed and, in some cases reversed to create better health outcomes and quality of life. It is therefore important to identify older people who are living with frailty. Not all older people are frail and not all people living with frailty are old. However, it is important to identify frailty early in order to combat the condition and it effects. Current health guidelines suggest that people over the age of 70 should be screened routinely. 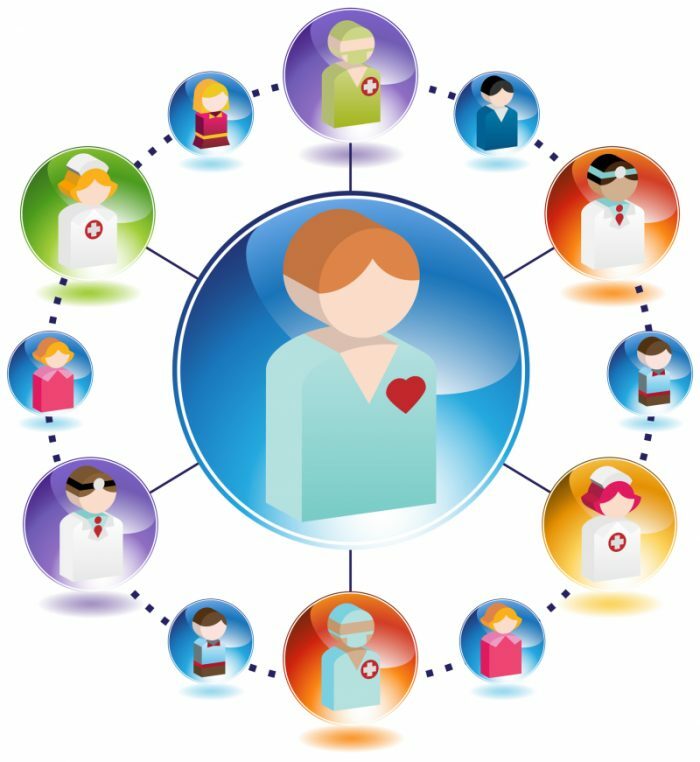 The use of a validated screening tool will ensure accuracy, reliably and consistency of identification of frailty. 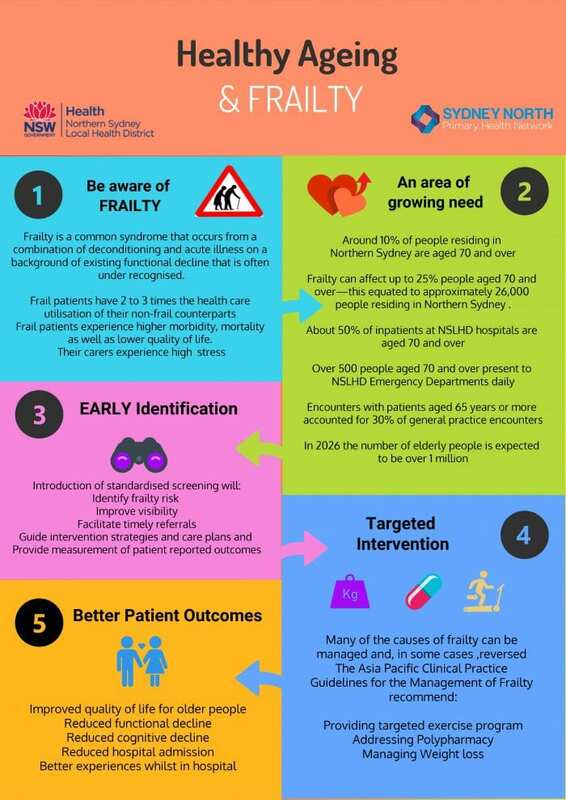 In Northern Sydney we recommend the use of the “The FRAIL Scale” to identify a level of frailty. A score of 1 to 2 indicates pre-frailty and a score of 3 or more indicates frailty. Frailty is more common in females and the risk of frailty increases with age. Early intervention can allow people to stay active and healthy longer, keeping them in their homes and out of hospital. Correctly managing frailty can significantly improve a persons function and quality of life. It can also provide a better chance of recovery from acute illness as it reduces susceptibility to negative health outcomes. 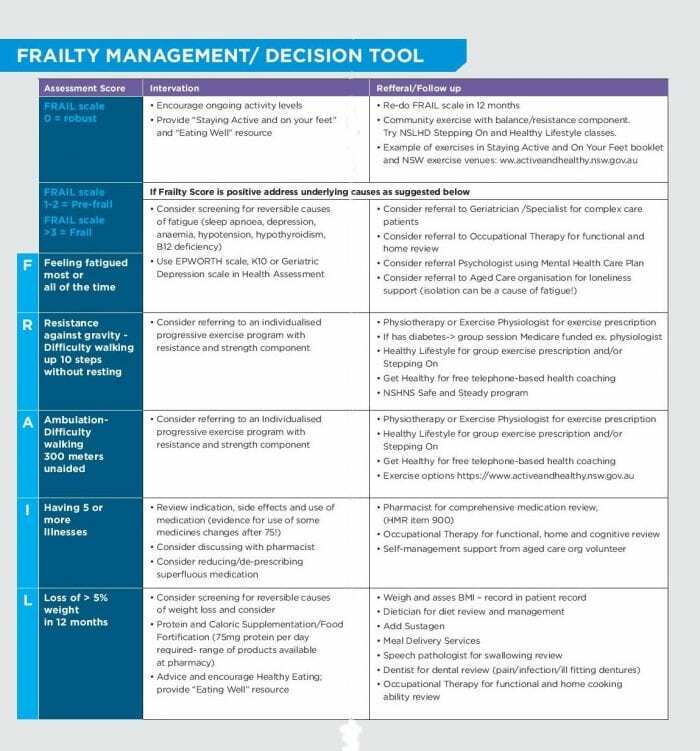 Once you have assessed a persons level of frailty a (pre-frail or frail,) it is important to develop a management plan that addresses the corresponding sections of the frail scale. The decision support tool below provides more detail and some guidance for best course of action. The Best Practice and Medical Director templates (.rtf files) can be imported to your software. These templates should not be opened and viewed before importing them. You will need to right click, copy and save or drag the .rtf file onto your desktop. Refer to the instructions below. Directions on how to upload templates Read Instructions. Frail Scale for Medical Director (MD). To download, please Right Click and save link (clicking directly on this link will load the BP file into your web browser instead). 75+ assessment that includes Frail scale (MD). To download, please Right Click and save link (clicking directly on this link will load the BP file into your web browser instead). Frail Scale for Best Practice (BP). To download, please Right Click and save link (clicking directly on this link will load the BP file into your web browser instead). 75+ assessment that includes Frail scale (BP). To download, please Right Click and save link (clicking directly on this link will load the BP file into your web browser instead). 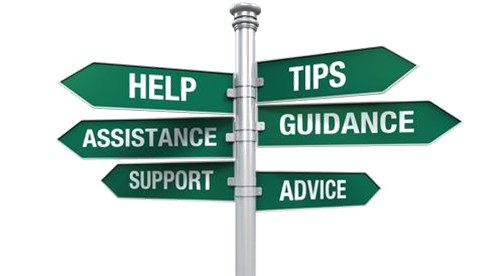 Please find the following links and searches to help you find the most appropriate service for your patients. For detailed clinical referral , assessment and management information related to the Northern Sydney region please visit Sydney North HealthPathways site. Click on the logo below – note: log in details are required and if you do not already have these please email healthpathways@snhn.org.au and they will be sent directly to you. Please use this search tool for Allied Health providers in Northern Sydney listed with an interest in frailty as registered in the Primary Health Network, this includes pharmacists that can assist with polypharmacy review. For patients requiring individual exercise prescription, a physiotherapist or exercise physiologist can assess gait and balance, design an individually-tailored program, provide one-on-one progressive exercises and recommend correct use of assistive devices. The Northern Sydney Frailty Initiative held two education event in December 2018. The education event aimed to assist health professionals further understand the impact of frailty on patients and how early identification and targeted intervention can reduce frailty, avoid inappropriate hospital admissions, keep people well and at home for longer and reduce need for RACF and hospital admissions. 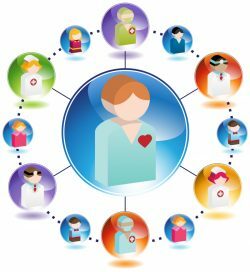 It also demonstrated the use of the frail scale scaler and supporting management plans to address the reversible contributing factors of frailty in your day to day practice. An article has been written by Dr Chris Bollen for the Norther Sydney Frailty Initiative. It is article 1 of a 3 part series based on the concepts of frailty and better care for older people from a GP perspective.